Whenever the spring and summer months make an appearance, it's always a good idea to crank the beauty routine up a notch. It's all well and good stretching out toenail paintings and body moisturising when you're wrapped up in ten layers over the winter (guilty) but once those skirts and sandals come out, those lazy ways just aint gonna cut it sunshine! At this time of year I like products that are fresh, uplifting and most of all quick and easy to use. Here are some of the bath and body products I'm currently using and loving for the springtime, I'll be talking about my makeup and nails picks in another post because there's quite a lot of them! Hot day, sticky moisturiser- one word: yuck. Should we get some warm weather this year, I'm sure the last thing on most of our minds will be slapping on a thick body butter. However when you've been sitting out in the sun, going swimming (or just generally spending more time outside, doing those fun sunny day kinda things) the skin will soon start drying out. A spray of this will have it feeling soft and replenished again, best of all it absorbs within seconds and doesn't leave that sticky greasy residue like most body moisturisers. This really is a wonder product and especially perfect for spring and summer- whether you're a lazy body moisturiser or are just looking for a quick and easy moisturising method pop a tin of this in your basket in Boots or Superdrug. This is my absolute favourite shower gel, you can't get any fresher and fruitier than this. Usually beautifully scented shower gels from the highstreet are either really drying or weak and watery but this is neither, it foams up like a dream and doesn't leave the skin feeling stripped of moisture. If you've tried any of Nspa's products before you'll probably have an idea of how nice this smells, I got it along with the Passionfruit scent (also amazing) on a 'two for £4' deal at Asda. Even if you're really good with remembering an SPF, do you remember to protect your hair from the sun too? Luckily a quick spray through with your regular heat protectant will shield your hair from the suns damaging rays. I like this one by Andrew Barton, it sprays so finely and feels weightless in the hair. It also smells really fresh too, a lot like lemonade! So this might not be an essential depending on your skin tone, but it certainly is for me with my paper white legs. This is a body tanner but I use it on my face too, and while it looks pretty shocking at first I find that once I have my foundation and bronzer on it really warms up my skintone and makes me look a lot more...well not tanned but definitely less ghostly. This is in the medium colour, but I've also tried the dark which surprisingly does look ok even if you're really pale. As with the skin, lips can soon become dry and chapped and if you're spending time outside in the sun. Unless you fancy teaming your pretty spring summer lip colours with crusty lips then it's worth making sure you have an effective lip balm on hand. 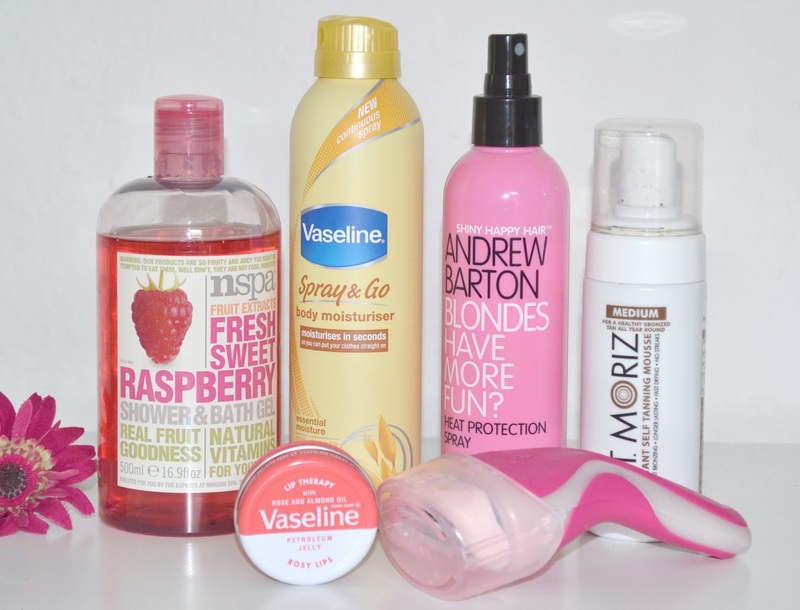 You can't go wrong with Vaseline lip balms- they're cheap, the sturdy tins hold up well in your bag or pocket when you're out and about and they really get the job done. I like the Rosy Lips version which gives a slight tint to the lips, perfect if you don't feel like layering on a load of lip products. Never the most glamorous of topics, but lets face it we all have to tackle the situation- and even more frequently when you're planning on getting your legs out. You'd think there would only be so much that could be said about a razor but this thing is brilliant; it's a three in one jobby that 'lathers, shaves and moisturises' and it most definitely does all of that (and that's coming from me who's usually highly skeptical of products that claim to multitask). The razor head is suspended in a creamy soap and has a strip of gel under the three blades so you don't need to mess around lathering up shaving foam- just wet the razor and your legs and it's ready to go. Just the thing for the job for a quick morning shower, I don't think I've ever used a razor that's worked so well. What are your spring beauty essentials? Have you tried any of these products? The nspa shower gel sounds lovely, their products always smell amazing!! Is the moisturiser pretty precise to apply? I've thought about trying it for a while but the image of me spraying it up the walls and over the floor has put me off! Hehe! Vaseline Spray and Go is awesome! I have this razor and I highly recommend it. It's so easy to use and so good I'll never switch to anything else! Love the look of the nspa shower gel, I'm quite tempted by the mango one. I haven't tried the spray lotion yet but as summer approaches, I think I need to cave! Heat protector that smells like lemonade sounds amazing! Will definitely be looking out for that!! Just started following and am new to the blog scene. Please follow me back? Great post! I'm also a huge fan of the St Moriz tan in Medium too, its brilliant and such a cheap price :) Can't go wrong!